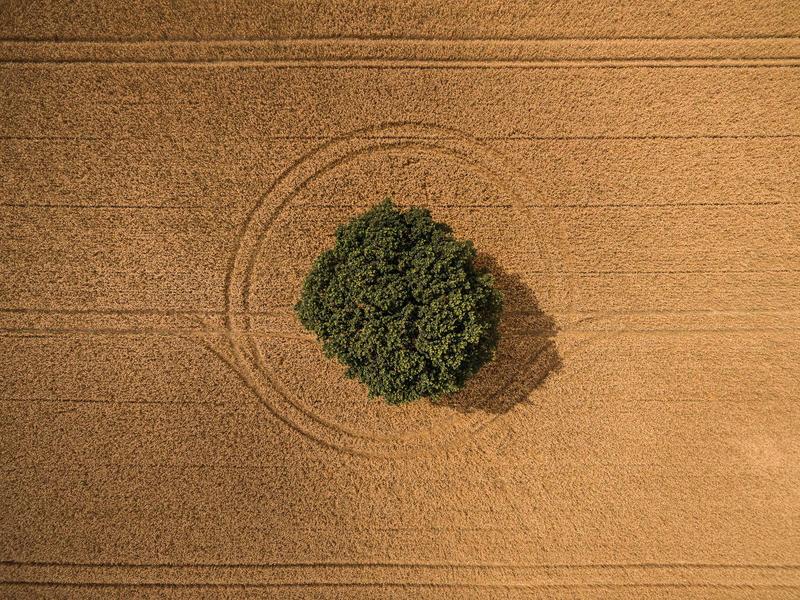 Drone photography will give you a world of new opportunities to create unique landscape images. 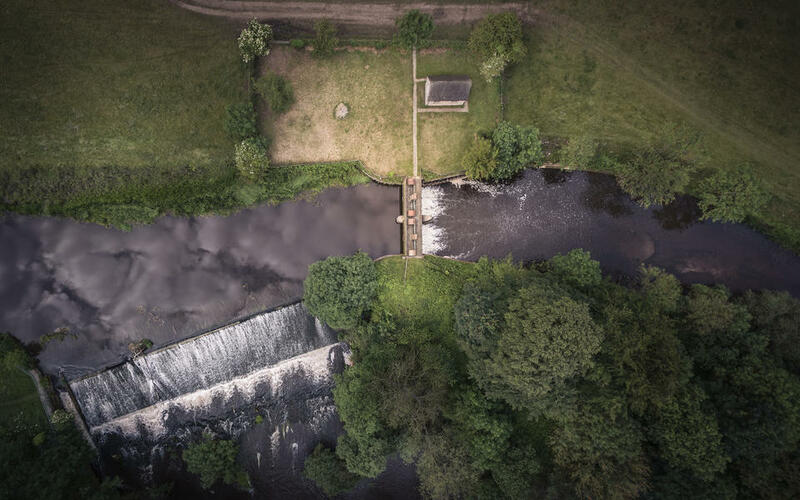 However, it can sometimes be tricky finding new locations to shoot, especially when using a drone as there are many restrictions which can limit where you can fly. 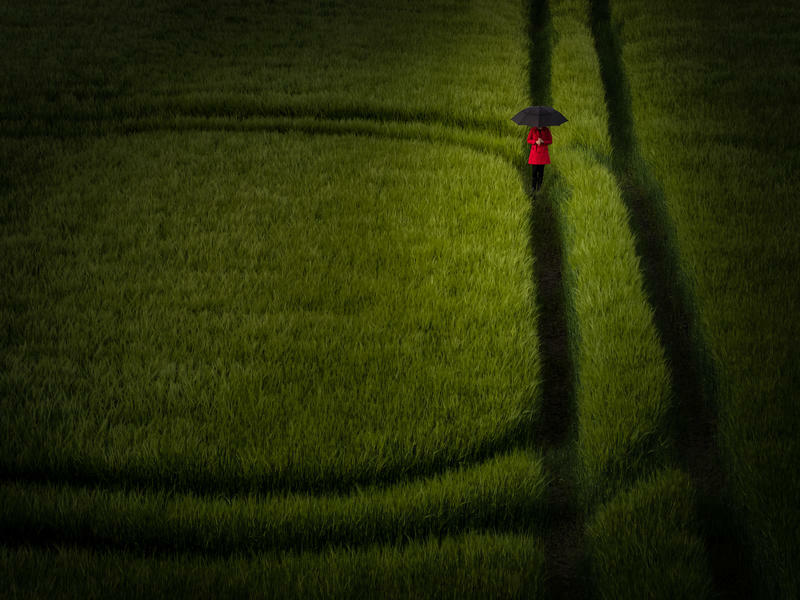 Using Google Maps can help you find interesting compositions within the landscape. Earlier this year I was searching for photographic opportunities near home when I found what appeared to be a scrap yard just a few miles away. 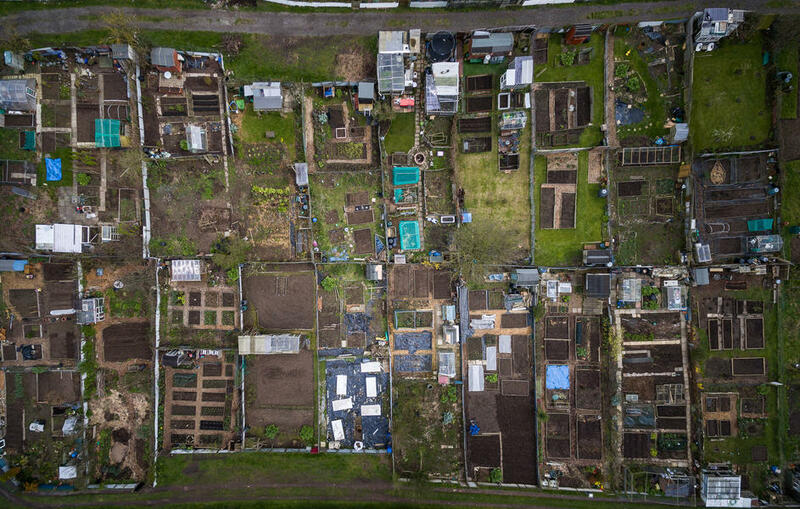 I was aware that I would be required to ask the owner’s permission to fly over such a location and, given the recent bad press in the media, I was quite apprehensive and a little nervous about asking for permission to fly over their property. I was pleasantly surprised when the owner welcomed my request with great interest. I have experienced a positive response from property owners when I have wanted to capture compositions on private land, so don’t be afraid of approaching the landowners for permission to fly as, in my experience, you will get the answer you want. Flying safely and legally will stop the hobby becoming a socially unacceptable pastime. Those relatively new to drone photography should be aware that just because the drone can get to a unique vantage point you otherwise couldn't, it doesn't necessarily guarantee a great picture. Subject matter and what you leave in and exclude from a shot is more important than getting up at say 4am to catch the vibrant morning colours of a sunrise. The drone's camera has a fixed aperture, is designed for maximum depth of field and is unsuitable for long exposures, therefore a scene cannot be improved by dreamy, shallow depth of field or wispy motion blurred clouds. Again, the subject matter is key to a great photograph. When flying over what might initially seem to be a monotonous uninteresting landscape, look for something which is out of place in the scene. Make this the subject of the image and place it in one of the third intersections points. You can accentuate the subject in post processing to increase its presence in a final abstract image. 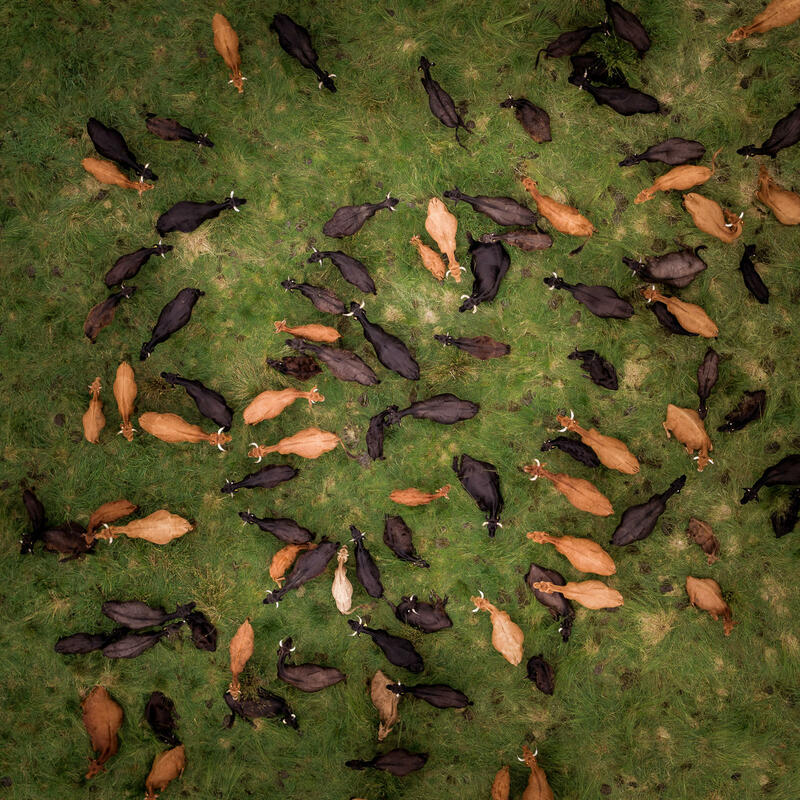 Never assume that because a scene or object does not look great at ground level it will look equally poor from the air. Most manmade structures and landscapes are designed and drawn in plan form and usually have pleasing aesthetic features or have strong geometric shapes and patterns. No matter what you see from ground level, power up the drone and go and have a look at it. A great number of my best shots have been taken when I thought there wasn’t anything worth photographing. 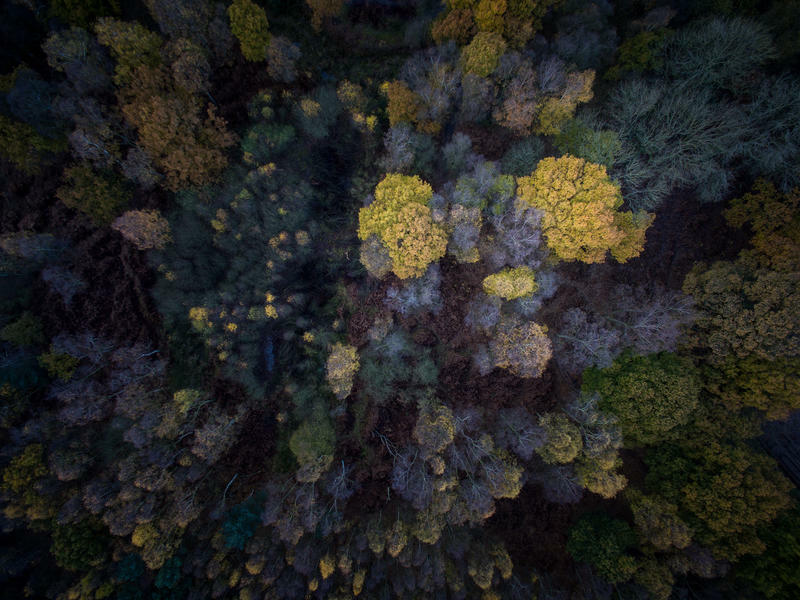 As it is likely that your drone will have a relatively low megapixel count by today’s standards, it is best to get the composition correct in camera when you take the shot. If you rely on correcting the composition by cropping and rotating the image in post-processing you will lose precious pixels. If your ground station app has the ability to show the thirds grid, use this to aid in your composition. The overlay grid is also an essential guide to getting your shots straight. Taken at the start of the Pocklington Canal at Canal Head, Top Lock is the first lock of 9 along the 10 mile stretch of the waterway. Having photographed the canal over several years, I had run out of unique viewpoints to shoot. 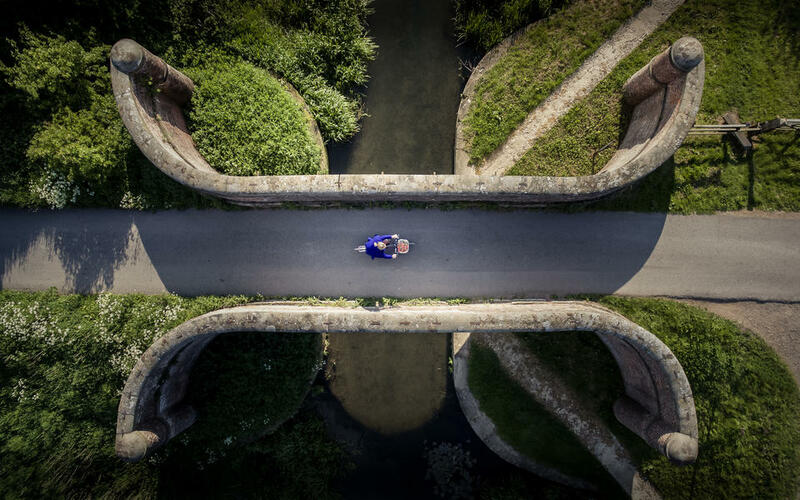 The drone gave me fresh new photographic opportunities and the geometric shapes of the canal gates are well suited to the 'top down' images I love. Small sensors don’t like high ISOs, especially the sensors in DJI’s Phantom 3 range. I find that an ISO above 100 can introduce lots of unwanted noise. I usually take shots in auto mode, but when the camera starts to increase ISO, I set it to manual. Drones, when set in GPS mode, can be remarkably stable. In light wind conditions, setting the shutter speed as low as 1/6th of a second to use an ISO of 100 can result in a sharp motion-free image. As I said earlier, by current standards the majority of camera drones available today have relatively low pixel count sensors compared to their SLR/CSC counterparts. The lack of pixel count can result in a loss of detail and limit the maximum acceptable printable size. One solution to overcome this problem could be to fly over your subject in a coordinated pattern and take a series of shots, these can then easily be stitched together in software programs such as Lightroom. There may be occasions when even shooting a subject at the maximum legal height of 400ft may not be high enough to capture the whole scene; taking a series of shots will again resolve this issue. This shot of Melbourne Basin near Pocklington was made up of 12 shots, each shot overlapping the adjacent one to aid in a clean stitched 27.4MP image. On occasions the drone may lose the GPS signal and aircraft will automatically switch to ATTI (attitude) mode. This can be quite alarming and unsettling when the ground station announces the error along with warning bleeps! If the drone is being flown in windy conditions the craft is unable to hold its position and will start to drift with the wind. Being able to quickly adapt to the conditions will avoid crashes and possible fly-aways. In ATTI mode the drone will remain stabilised and will lock flight altitude accurately. Some drones may produce more power output and speed in ATTI mode so this performance advantage can be used when required. 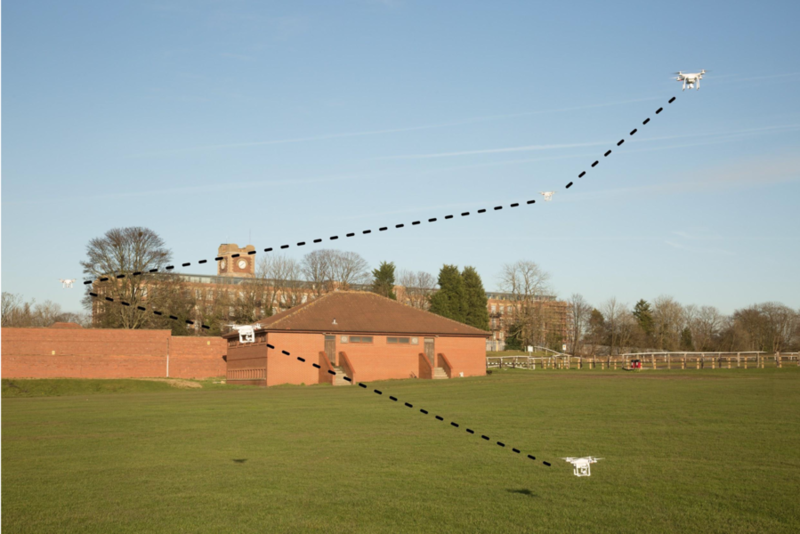 As the drone looks for satellites on the horizon, mountains, hills and tall structures can attenuate the signal, knowing how to fly in ATTI mode will enable you to still fly the drone unaided by GPS. Fly a descending circuit to land. Not only will this improve airmanship, it avoids the drone getting caught up in its own prop wash caused by the propellers. 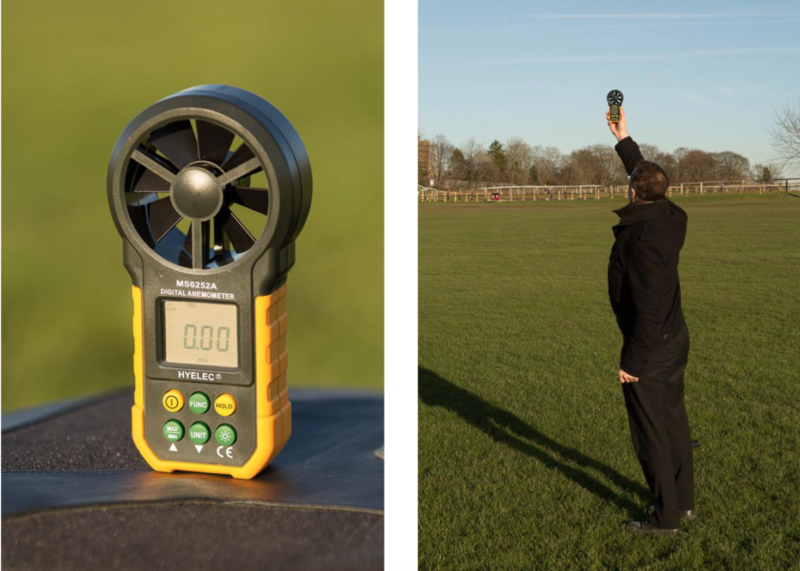 Anemometers measures wind speed and are relatively inexpensive pieces of equipment. Find the operating wind limits of your drone in the user manual. 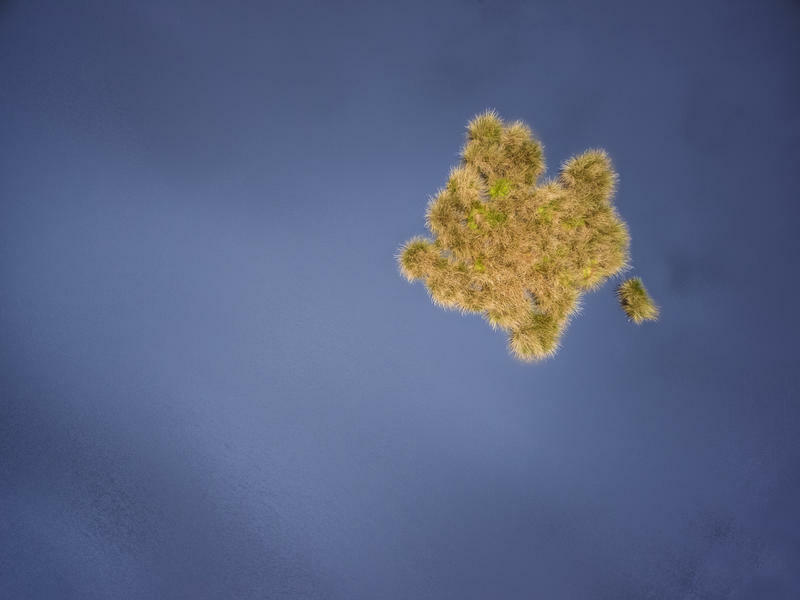 For example, my Phantom 3 can fly in conditions of up to 10m/s. Use the wind speed meter (much easier to pronounce than anemometer) to determine whether it is safe to fly. Hold the meter as high as you can for a minute or so to obtain a maximum wind gust speed. You may be surprised how much wind your drone can handle. Wind is likely to be stronger the higher up you fly so make sure to make an upwind pass first before you fly downwind. Lower the altitude of your drone if you find it cannot make headway against the wind. 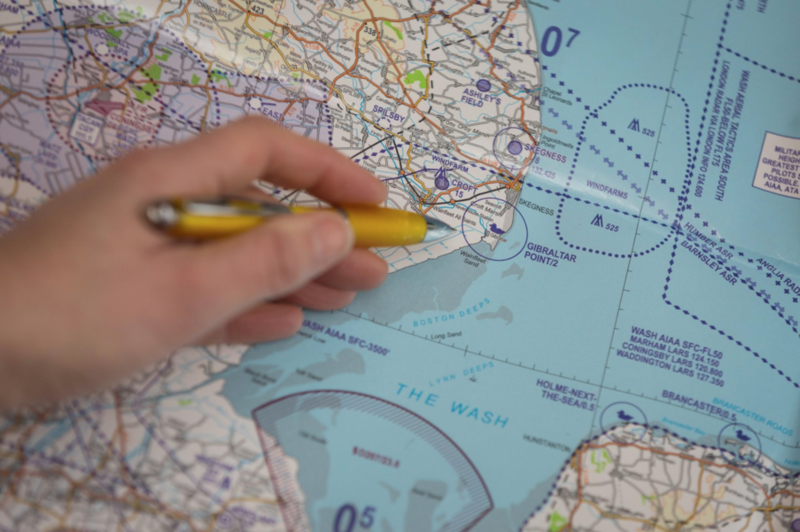 A CAA (Civil Aviation Authority) VFR Chart is an affordable map which provides detailed topographical information including runway layouts and restricted flying areas. In addition to aeronautical information, the charts provide hydrographic, topographic, cultural and other visual features. It is a common belief that drones are only restricted from flying near airports but there are numerous other features which require consideration before flying. Military low fly zones, areas of high radio interference and extensive restrictions near prisons (around a 5-mile radius) are just some of these which are indicated on the maps. Here we can see there is a flight restriction around Gibraltar point. This area is classed as a bird migration and areas with sensitive fauna, pilots are requested to avoid the area throughout the year. A NOTAM is a notice filed with an aviation authority to alert aircraft pilots of potential hazards along a flight route or at a location that could affect the safety of the flight. There are several sources for obtaining NOTAMs (or a Notice to Airmen) information – www.notaminfo.com/ukmap is one of them. Notaminfo.com get their data from NAT (National Air Traffic Services) and is updated on an hourly basis. You can view current NOTAM data or see NOTAMs which have been submitted for the week ahead. Alternatively, you could try downloading Drone Assist for your smartphone or tablet. 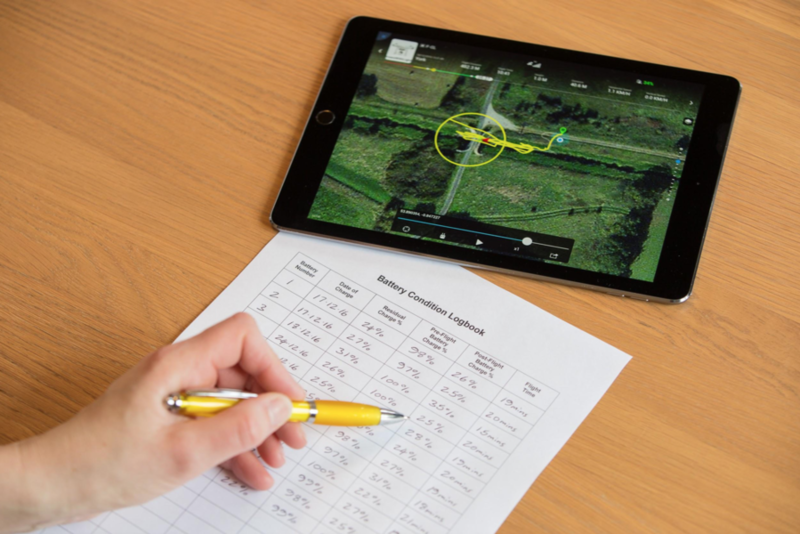 Drone Assist is the new drone safety app from NATS, the UK’s main air traffic control provider, powered by Altitude Angel. It presents users with an interactive map of airspace used by commercial air traffic so that you can see areas to avoid or in which extreme caution should be exercised, as well as ground hazards that may pose safety, security or privacy risks when you’re out flying your drone. 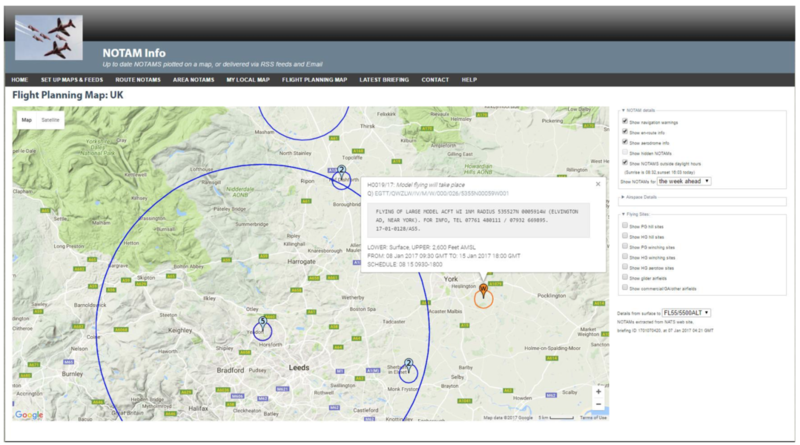 It also contains a ‘Fly Now’ feature that enables you to share your drone flight location with other app users and the wider drone community, helping to reduce the risk of a drone-related incident in the UK’s airspace. 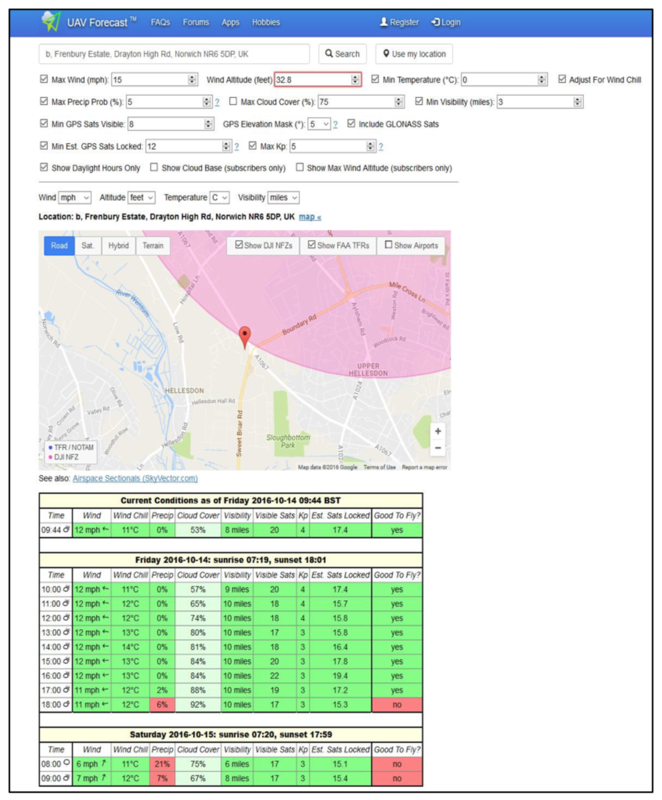 UAV Forecast provides drone pilots with the necessary information needed to fly their drone safely within given time periods. It shows airports and restricted areas, weather forecasts, estimated GPS satellites available and, something which not many people are aware of, the Kp index. The Kp index measures geomagnetic disruption caused by solar activity, on a scale from 0 (calm) to 9 (major storm). Anything at or below 3 or 4 is usually safe for flying. The higher the Kp index, the more likely you are to have difficulties getting an accurate GPS lock. The effects also vary; sometimes everything will be fine, while at other times you'll lose lock completely for a few seconds or even a minute, or appear to have a lock but the position will actually be wrong by hundreds of metres. Modern Wi-Fi routers can emit a signal far beyond what might be perceived. Most drones use the same frequency and technology as these routers and the signal between transmitter and drone can face interference. 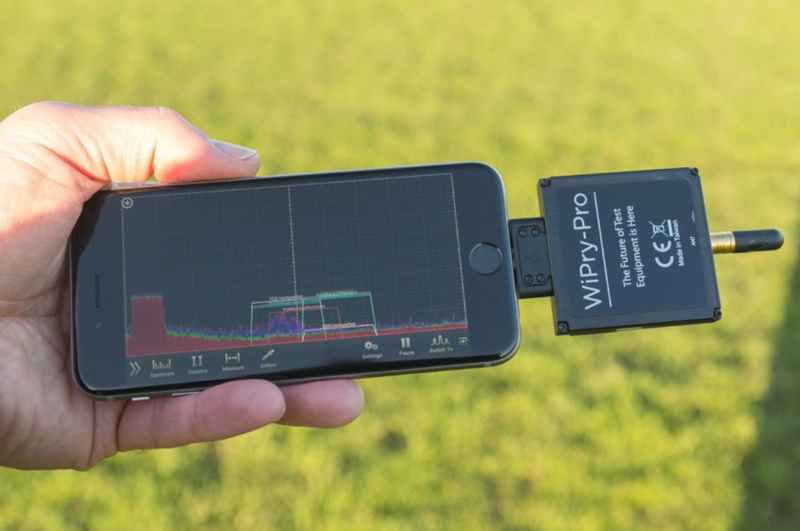 The use of a signal spectrum analyser will identify any radio frequencies around the area you intend to fly and the potential for interference can be evaluated. The data signal is also susceptible to attenuation by high levels of moisture in the air. Mist and fog can significantly reduce the range of the signal. You can test the range in these conditions by the use of a signal spectrum analyser. If in doubt, don’t fly. Looking at the screen, we see that other radio frequencies in the area I intend to fly in. The strong peak on the left-hand side is the W-iFi signal from my transmitter to the drone. The transmitter has picked a clear frequency which will allow me to fly safely. Despite close and detailed inspection of weather reports, when we get to a location the conditions are often not what we expected. Don't let that put you off, try and imagine how you could process the image to create a ‘mood’. Use the dodge and burn tool to add light and shade to create a foreboding image. For example, adding a strong vignette will help keep the eye within the frame and, as with the image below, create a sense of enclosure. The ground station (e.g. DJI’s Go app) provides detailed information about your battery voltage and temperature. Monitor these values before and during flying, especially in cold conditions. Keep a log of the available charge before flying and once landed, record these values along with your flying time. Monitor the logs on a regular basis to spot any erroneous readings, i.e. if you fly with a battery that regularly provides 18mins of flying time but this starts to reduce, it can give you early warning that the battery may be starting to develop a fault. Now the winter months are upon us, flying in cold weather has its problems. Find the minimum (and maximum) operating temperatures of your drone in the user manual and don't exceed these parameters. Battery performance degrades significantly in cold weather and voltage drops can be sudden and unexpected, and flying time will be reduced. Bear this in mind when flying to the legal limits of distance and always allow plenty of time to bring your drone back to the ‘home’ point. Avoid flying with a part-used battery. Even if you land with 50% charge, the change in temperature within the battery, and environmentally, can give inaccurate readings as to its remaining power in the ground station. You can, for example, transport your batteries in a well-insulated coolbag containing a heat source such as a microwavable heating pad to maintain a good operating temperature or even keep them under your clothing close to your body. How many times have you launched your drone only to find you’ve forgotten to insert the SD card? I’ve done it several times! Creating a thorough checklist of tasks to carry out before you fly can also help to identify potential crash-causing defects before you get off the ground. Double-checking propellers are securely fixed, batteries properly inserted, compass calibration undertaken, gimbal lock removed and the home point is recorded are a few which can be added to your checklist. Read through the user manual for your drone and search the internet for checks, which should be carried out before and after flying, which are relevant to your aircraft. Insurance for recreational use is inexpensive and provides peace of mind should anything go wrong. Organisations such as FPV UK, a non-profit association of hobbyist radio control model aircraft pilots can provide £5 million public liability insurance cover for all of your flying. Membership costs just £15.80 per year and 9 months, 6 months, 3 months pro-rata memberships are offered as the year goes on. Insurance can also be obtained by joining the British Model Flying Association. The BMFA is the National Governing Body for the sport of model flying. Its aims are to promote, protect, organise and encourage model flying within the UK. Membership to the BMFA starts at £17 for Junior members and £33 for Senior members. Please note that these insurance policies are unlikely to cover crash damage and are certainly do not cover for commercial use. Commercial insurance policies are available which do cover crash damage but these can only be taken out by those who are approved by the Civil Aviation Authority for commercial operations. 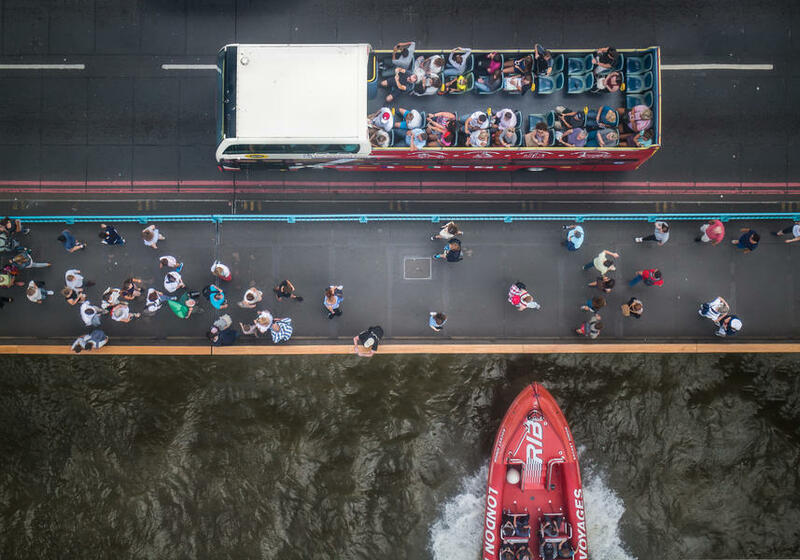 If you’re thinking of trying your hand at creating stunning aerial photography, then take some inspiration from the best drone photography of 2017 from Photocrowd photographers. 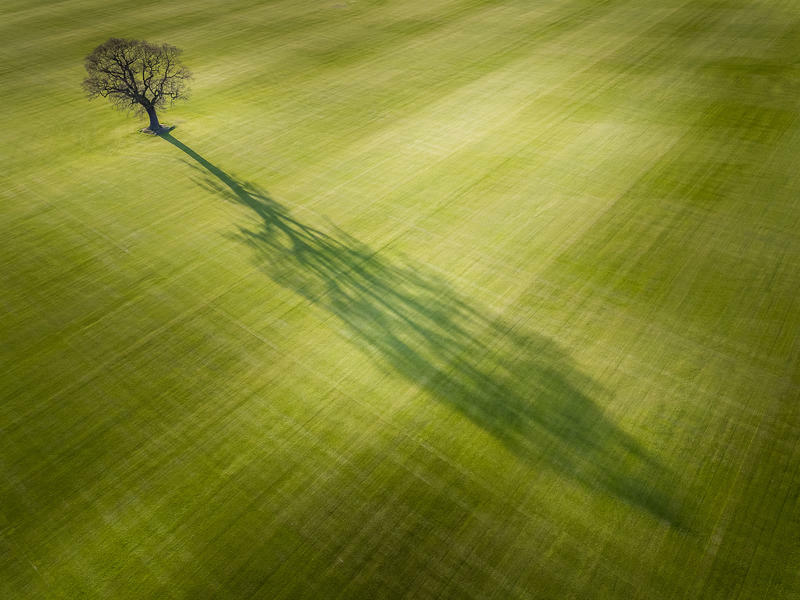 During his brief foray into aerial photography, David has been fortunate to have had three images commended in the Landscape Photographer of the Year competition 2016 and two commended and highly commended images in the 2017 competition. 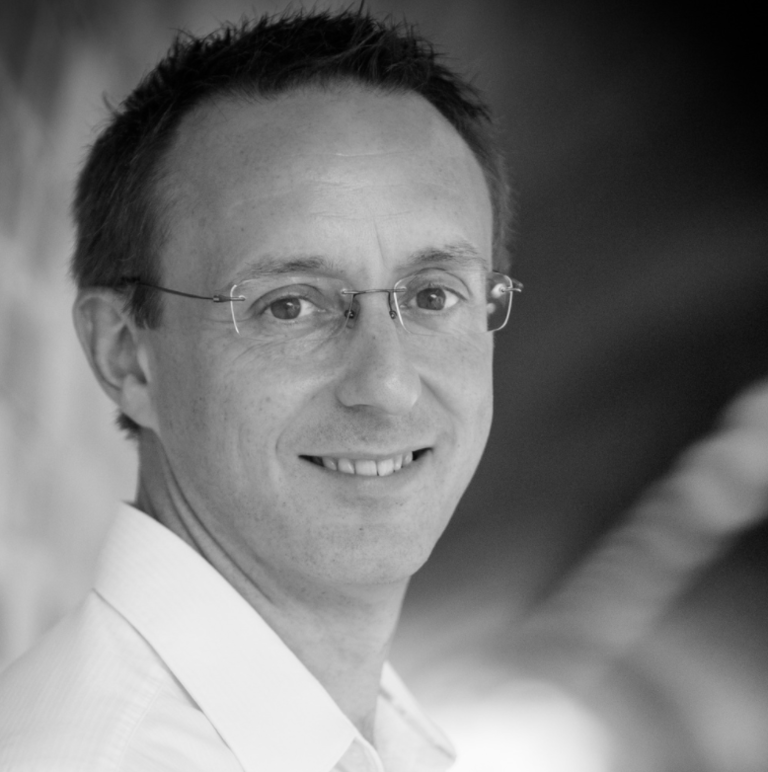 You can also visit David's Photocrowd page here.